In this video, Timothy Cheblokov, Senior Software Engineer at NVIDIA, details the three most important things developers need to know about WaveWorks 2.0. WaveWorks supports all the major graphics APIs now, and uses DirectX or Vulkan Compute shaders to run simulations and postprocess the results on GPU. If needed, the simulation can also run on CPU. 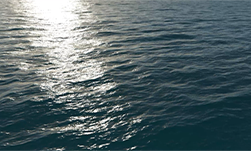 WaveWorks generates anisotropic BRDF data for water surface in realtime, enabling use of physically based rendering for the ocean surface in the modern engines. New WaveWorks release uses dual customizable JONSWAP spectra, each with individual parameters like wind speed, wind direction, amplitude, et cetera. This enables simulating virtually any possible sea state that one can see in nature. For example, you can see small or medium waves that are generated by local winds, and in the same place you will see some very long decaying waves can were generated by a distant storm a while ago. The WaveWorks 2.0 release adds implementation for simulating interactive wakes like wakes, explosions, etc. This adds a lot to the immersion and visual fidelity in games where action takes place in the seas. WaveWorks 2.0 is coming soon.